A march of students in Rockville, Maryland, protesting the election of Donald Trump to the presidency turned violent on Wednesday morning as a teenager wearing one of the Trump campaigns "Make American Great Again" hats was beaten. A student involved in the beating is facing assault charges. 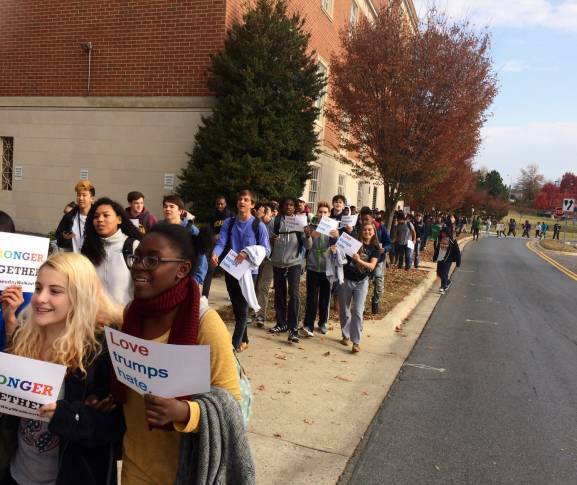 Hundreds of students from Richard Montgomery High School were carrying signs reading, “Love Trumps Hate,” and chanting near the Rockville courthouse on Maryland Avenue in a protest that began at about 10 a.m. when a 15-year-old boy wearing one of the Trump campaign’s “Make America Great Again” hats was attacked by about four students. Police officers are talking with witnesses. There was a large police presence during the protest, but there were no further problems. The students returned to the school’s football field at about 11:30 a.m.
Also on Wednesday, dozens of high school students left Montgomery County schools and lined busy roads to march, wave signs and solicit responses from passing traffic. A demonstration in the area of Kentlands — along Great Seneca Highway and Quince Orchard Road — was to protest the Trump presidency, but participating students from Northwest High School say they were trying to promote positive thoughts. “We’re trying to get people together instead of saying more negative things that add on more conflict,” said tenth grader Anyah Clayton. Twelfth grader Taylor Clayton said Trump supporters at her school had made rude, racist comments since the election. Students in Wednesday’s Kentlands area protest were from Northwest, Seneca Valley and Quince Orchard High Schools. The Rockville march marked the third straight day of student protests in the D.C. region in opposition to Trump’s election. On Tuesday, hundreds of students from D.C. public schools walked out of class to protest in front of Trump’s downtown D.C. hotel and then marched up Pennsylvania Avenue to the Capitol and Supreme Court. On Monday, hundreds of Montgomery County high schools participated in protests that briefly blocked parts of University Boulevard that morning. WTOP’s Nick Iannelli contributed to this report from Rockville. WTOP’s Lisa Weiner and Sarah Beth Hensley contributed to this report from Washington. WTOP’s Kristi King contributed to this report from Gaithersburg.